Seeing as it'll shortly be Halloween, I thought I'd post a couple of retro reviews of some offbeat horror films. 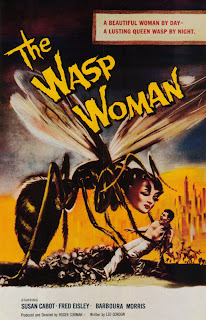 First up, 1960's "The Wasp Woman." This is a Roger Corman classic. For those who don't know, Roger Corman was responsible for the best b-movies ever to come out on the big screen - especially the big screen you watched from your Toranado (if you know what I mean and I think you do.) He gave many of the biggest names in Hollywood their starts - including Francis Ford Coppola, Jack Nicholson, and Martin Scorsese (another of my Hollywood gods). The man knew talent, he understood making films, and above all, he needed no budget. This devotion to the craft of thrift meant he ended up directing more than 55 films, and producing over 380 (and counting!). "The Wasp Woman" is one of my favorites. One thing you have to give Corman - despite producing exploitation theater, he did have roles for women that were surprising for the period. The Woman of "The Wasp Woman" is Susan Cabot as Janice Starlin, an over-the-hill head of a cosmetics company. Now, the movie could have left a simple with for a return to youth as the motive for Ms. Starlin to use a dangerous experimental drug made from wasp royal jelly. Instead, we are provided with the explanation that Ms. Starlin is no longer the model for her company, because of her aging, and that the company is suffering financial problems because of it. Nice little tip of the hat to societal pressures for women to stay young here - but we won't get too deep into the plot (and all its underlying references to drugs, standards of masculinity and femininity, etc). You can figure out that stuff for yourselves.